Several hot tub manufacturer's use different error codes to display faults and issues on the hot tub LCD screen. Once you know your hot tub's company, you can figure out what each error code means and how to fix it. The codes are often initials that represent a shortened error message. Find the error code for your hot tub. Error codes display on the LCD screen using a mix of letters and numbers. "COOL" means that the hot tub is at least 20 degrees cooler than the chosen setting. "Sn1" and "Sn3" are sensor errors and usually need replacement parts. "FLO2" is a flow switch that affects the start of the hot tub. "PnL" means that the control board communications have malfunctioned. 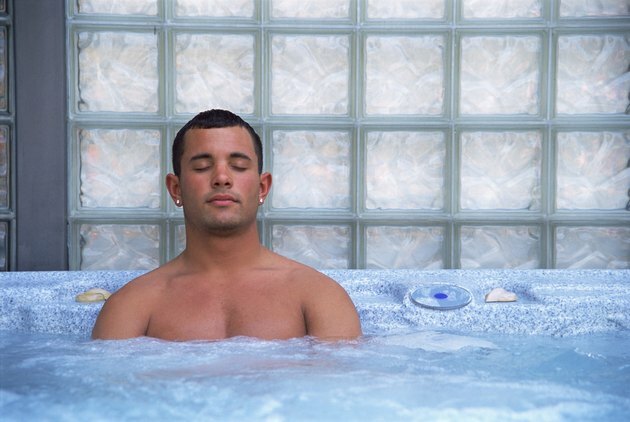 Sundance Spas use similar error codes to the Jacuzzi Whirlpool like "Sn1" and "Sn3" for sensor issues. "ILOC" is an "Interlock Failure" that occurs when the pump malfunctions. "Hold" appears when the panel malfunctions or too many buttons are pushed. Water temperature errors appear on these hot tubs as "HiLi" or "FP." The temperature will not increase or heat the water until the conditions have changed. "SS" and "LS" errors appear when circuits or control board errors occur. "FLC" and "FLO" are pressure switches that occur when the pressure alarm is activated. "Prr" and "Prh" appear when the sensors malfunction. "HL" occurs when the hot tub temperature gets too high. The error "pd" occurs when the power supply has been cut off to the hot tub. "OHH" and "OHs" are overheating errors and will appear as the hot tub shuts off to cool down. "SnA," "SnB" and "Sns" are sensor errors and need replacement parts. The errors "dr" and "Dry" occur when the water level is too low in the hot tub. A collection of hot tubs use the same error codes to display messages. "OH" is common for "Over Heating." "ICE" stands for freezing temperatures. "TU" is a temperature setting change that means the temperature appears in Celsius or Fahrenheit.